Part of the Urglaawe Folklore Research Project in the Pennsylvania German communities in Pennsylvania and the Diaspora. A common Deitsch tradition tonight is to put a coin (or coins) outside on your windowsill overnight tonight. Some variations specify that the coin/s should be silver. Others specify three denominations (nickel, dime, quarter, etc.) of coin. Some Christian interpretations are that these are for the Magi on their way to Bethlehem (PA? lol), while other interpretations definitely have this related to magic that easily fits in with Berchta making the rounds as a beggar. If the coins are gone, then the need was greater elsewhere, and you will receive good luck for aiding another. Tonight is Berchta’s feast night, and Urglaawer are preparing for Her requires meal of herring and gruel or Zammede (pancakes made only of flour and water). This week, minor earthquakes with epicenters in Berks County rattled the heart of the Deitscherei, so it is time to revisit some scant references that had grown cold over the years. Although the names were usually unknown to folks with whom I had spoken, more people knew of an "Earthquake Giant" ("Erdbewung-Ries") as a concept. Der Bollerfuus ("rumble foot") was said to live within the Montour Ridge near Mausdale, PA, in Montour County. In a similar manner, Der Gerumpelfuus (also translating to "rumble foot") was said to live in Raccoon Mountain near Williamsport in Lycoming County, PA. The third, der Zidderfuus ("tremble foot") has no designated home but was actually the name reported around the Lancaster Seismic Zone, which is the region with the most seismic activity in Pennsylvania. In the case of their more recent activity, they were said to have been asleep but were re-awakened by human actions, particularly, whether accurately or not, by fracking or by wastewater disposal. In an angry state, they were said "to shake the world around" ("die Welt rumzuschiddle"). A man once went hunting in the woods of Yellow Mountain (Berks County) during the last quarter of the moon. When he loaded his gun to shoot at a deer he saw, he hung his powder horn on a horn of the moon, not thinking it odd to be able to do so. After he shot the deer, the moon had risen so high that he could not reach his horn anymore. He piled wood to stand on, but the moon kept rising out of his reach until his horn was gone. As he came home, he told his neighbors and family about what happened, and they told him that his horn had been stolen by the Man in the Moon and suggested he talk to an elderly woman who lived in the woods. The next day, he visited the old woman, who was adept in the magic of Hexerei. She advised him to return to that same spot on the night the new moon. He did so, and he found his powder horn next to the pile of wood he had stood on. Note: Several variants of this story have emerged from oral reports (numbering a total of 27) in Berks County (where Yellow Mountain was the most common setting) and Lehigh County (where most reports did not give a specific setting and two gave Allemengel as the location). In a few reports, the moon was in the last waxing quarter and the horn dropped when the moon was full. The Man in the Moon was named in most of the reports. In a few others, it was merely the action of the moon rising that caused the hunter not to be able to reach his powder horn. In one report, it was the placement of a horn (powder) onto a horn (moon) that caused the moon to get angry with the hunter and to keep the horn. In seven of the reports, the hunter was not an honorable man, and the loss of the powder horn could be seen as a punishment. Gedreier Eckhart is one of the more interesting characters in our folklore. For me personally, this is partially because Eckhart is a family surname and also because, somehow, much of my family was aware of the connection between Eckhart and Holle while I somehow did not make the connection until I fully identified as Urglaawer. Weird. There is not a huge volume of oral lore on him from Deitsch lore, but what we do have makes him an important player in the Urglaawe view of the Wild Hunt. Our lore is consistent with much of the lore of other German lands as well. Eckhart’s roots run deep in Germanic lore. He is of the war band of Dietrich of Bern. He appears as Eckewart the Margrave in the Nibelungenlied, and in a Heldenbuch appendix, he is said to stand before the entrance to Holle’s realm to warn or to frighten away anyone who wished to enter. He also appears in the Middle Ages tale of the Tannhãuser, and Grimm (936) postulates that he was perhaps functioning as a Heathen priest. In our lore, he may have been an incarnation of die Weisskeppich Fraa (but that sense appears to be an outlier). Eckhart is a loyal character throughout the heroic legends, but, in Deitsch lore anyway, his title of Gedreier (“Loyal”) comes from his dedication and service to Holle. He appears with a white beard and a white staff. He is deceased, yet he continues to serve the goddess in death just as he did in life. Our lore places him as sleeping in a linden tree or in a rock until Holle has need of him. In Germanic lore, including that of the Deitsch, he precedes the Geischderschtrutz, or the Parade of Spirits (read: the Wild Hunt), warning the living to get out of the way of the impending fury and also advising the living to be prepared for Holle’s inspection. As the Parade continues and, as Deitsch lore says, meets up with Berchta and the souls of those who have passed since the Hunt began, Eckhart guides the souls of the Parade to Holle’s Mill, where they are crushed into separate parts and reconstituted into new soul constructs. In this sense, it appears that Eckhart is very much functioning as a psychopomp, guiding the souls of the deceased to the end of their journey. I have been playing the role of Eckhart in Philadelphia’s Parade of Spirits for several years, and I have been reflecting that psychopomp role without giving it due consideration. This year, I intend to make that role more pronounced. Since solar eclipses are so rare, this is getting posted before the research is completed. It will be updated as it progresses. There are two types of stories related to eclipses. One is sort of "pro" eclipse and the other is rather "con" eclipse. An eclipse is called a "Finschderniss" (grammatically feminine, so it takes the article "die"), and an eclipse specifically of the sun is called "Sunnefinschderniss." "Finschderniss" is related to "finschder," means "murky" or "dark." 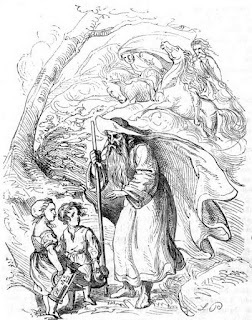 The "pro" story is that Sunna and Muun were lovers (some say married) but that the jealous trickster Schadde had gotten between them (this is where the versions of the stories get confusing, which is why they still have not been published), but he somehow manages to persuade the god associated with sleep, Schlumm, to cast sleep spells on each of them. While they are asleep, Schadde sets them into the sky so that he is between them. Sunna and Muun do a dance through the skies, trying to be together, and , when a solar eclipse happens, it means they have achieved that goal, with Muun tossing Schadde behind him. An echo of the noise-making appears in this context with some respondents saying that they tap drinking glasses at this time, which is reminiscent of what people do at weddings when they want the bride and groom to kiss. The reason this is only "sort of" pro is that the way Schadde persuades Schlumm to set them to sleep has something to do with imbalance in Mannheem, and Sunna and Muun being together too long would have catastrophic results. Someday I will get that story's versions harmonized. The other stories are akin to the Norse and other cultural stories: an animal (usually a fox or a wolf) is chasing the sun and catching it, and banging of pots and pans is performed to scare the animal away. denn wenn er aufsteht, dann geht sie schlafen. ein Pärchen werden sie nie. weil mich dein Mund so oft ich will am Tage küssen kann. dass sie noch träumen, verliebt vom Andern. ein Pärchen werden sie nie. Nie! Nie! Although it does not appear that we'll be dealing with freezing temperatures in the Deitscherei over the next three nights, we still observe the end of the Wonnezeit and keep an eye out for the first attack of the Reifries (Frost Giants). There are at least two full variants of this story exist along with several additional tidbits and remnants turning up in other areas. The versions of the story that make a complete tale are those of the Oley Freindschaft and the Harrity-Palmerton Freindschaft guilds of Braucherei, and their versions complement each other, with the Harrity-Palmerton version containing many details that the Oley version lacked. There are some clashing points between the versions, such as one stating that each Butzemann defends only his own property and the other referring to the Butzemann army taking the battle with the Frost Giants into the north. This is the first, raw, harmonized version, which includes features of both principal complete versions as well as aspects of the remnants of others. The final version will be published in the near future. Der Reifkeenich (King Frost) heard that the Wild Hunt had returned to Mannheem (the home of humanity) and that his armies were in retreat from Hexefeld as the Wonnedanz revitalized the land. 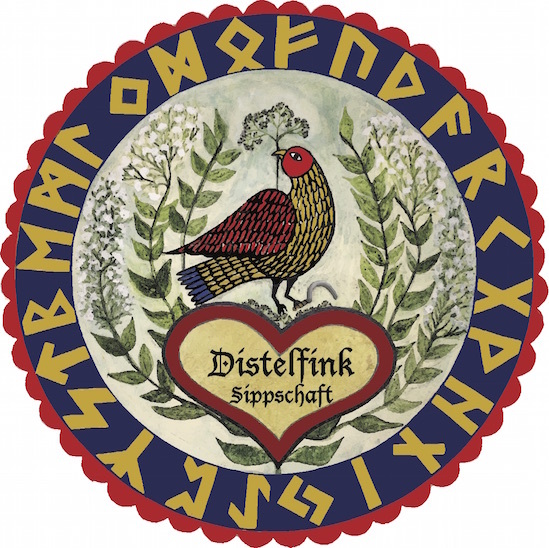 He first ordered Dreizehdax ("Thirteen-Badger") to go to Mannheem to reclaim his lost holdings. The next day, he dispatched Vatzehvedder (or Vatzehfedder, which may be a dialectic reference to "Fourteen-Porcupine"), and on the third day, he sent Fuffzehfux ("Fifteen-Fox"). Each took with him an army of Giants and allies. Dreizehdax and his soldiers journeyed twelve nights from the Naddbledder ("Northern Leaves" of the World Tree). As they arrived in Mannheem, they brought the temperature down so much tender plants that could not withstand the cold. Dreizehdax and his soldiers feasted upon the spirits of the dying plants. Dreizehdax led his army down from the north, eventually arriving in the farmlands. Suddenly, he caught the gaze of a large, powerful, reddish-haired man, and he immediately recognized Him as Dunner. Dunner stood between Dreizehdax and the farmland, which Dreizehdax greedily wished to devour. The Butzemann (spiritually activated scarecrow) on each farm prepared to fight to protect their children, though they were young and were not sure that they could defeat Dreizehdax and his powerful soldiers. As the Frost Giants stepped forward, Dunner lifted his mighty Hammer and slew one soldier after another, leaving only Dreizehdax, who fled in terror back to the north. Dunner spoke to the Butzemenner (plural), telling them that He would teach them how to fight the Frost Giants. The next night, Vatzehvedder and his armies arrived in Mannheem. His army drenched the mountains in freezing rain, which stung the tenders, and the soldiers devoured the spirits of the dying plants. As the army approached the farmlands, Dunner raised His Hammer and commanded the rain to stop. He told all of the Butzemenner to come out of their shells to fight alongside Him. The spirit of each Butzemann stepped forth. Dunner fought the soldiers of Vatzehvedder with His hands, using His breath to warm the air and exerting His Megge (main, megin, life force energy) upon them, which caused them to melt. The Butzemenner followed suit, using the power of their Megge to surround the army so Dunner could destroy it. Vatzehvedder realized that his army was doomed, and he retreated to the north, joining Dreizehdax. On the third night, Fuffzehfux and his army arrived in Mannheem. He and his soldiers froze the mist in the air, which dropped deadly dew onto the leaves and stems of the tender plants. The dew tortured the tender plants and harmed even many hardier plants. The Frost Giants began to eat the spirits of the damaged plants. Suddenly, the Butzemenner emerged from their shells and rose up from the farmlands, coming into the north and destroying the soldiers while they feasted. As the Butzemenner stepped forward the frozen dew turned to a warm mist, and the plants rejoiced. Fuffzehfux soon found himself standing alone facing the Butzemann army, and he retreated to the north, joining Dreizehdax and Vatzehvedder. The three returned to the Naddbledder to bring the unhappy news of their defeat to King Frost. As each Butzemann returned home to defend his own land, Dunner appeared before them to congratulate them on their victory. "Your children may now safely take root in the soil of Mannheem." This is why the tender plants may be brought out after sunrise on May 15. Tobin, Jesse. Der Braucherei Weg (course). Kempton, PA: Three Sisters Center for the Healing Arts, 2007. Robert L. Schreiwer and Ammerili Eckhart, original research, 2009, 2011, 2012, 2013..
Today I was driving up to the Urglaawe cemetery on back roads. It was a nice day to drive after several days of heavy rain. I noticed that the Hollenbach (the Deitsch name for Jordan Creek in Lehigh County, PA) was flowing particularly strongly (and it normally is pretty fast to begin with), so I pulled onto a side road, got out of my truck, and walked onto a bridge that looks over the creek. While I was standing there, an old man walked up from the side road carrying fishing gear. He greeted me, and we struck up a conversation. Through the course of the chat, I mentioned the Urglaawe Folklore Research Project, which interested him immensely. This part of Lehigh County is Blobarrick (Blue Mountain) country and is thus Ewicher Yeeger's stomping grounds. I asked him if he knew any folk stories from the region, and he replied that he did. When I mentioned Ewicher Yeeger, his face lit up, and he said that he knew a few stories. One that he told was very similar to the Ewicher Yeeger story of Allemaengel, but then he told me an anecdote that I found interesting. He said that when he was a boy, his brother, some friends, and he used to fish in the Hollenbach, and there was an old man, whose name he could not recollect, who used to fish in the creek as well. He said the old man was very mysterious and he was not sure of much about him other than that he was from Werleseck (Werleys Corner) and that people considered him to be a hermit. The old man would talk to the boys and would tell them stories about the area (some of which he related to me). He said that what he recalled vividly was that he thought some of the man's actions were peculiar. He would throw beans, corn, worms, flowers or plants, cheese, or other items into the creek before and/or after he fished, whether he caught something or not. He said that when the old man would catch a fish, he would utter a word of thanks to the Eternal Hunter for giving him a meal that night. He would then throw some food into the creek for the fish. When I remarked on only having heard of Ewicher Yeeger in the context of the hunt, he replied, "Fishing is a bit like hunting, gell?" He then remarked that he thinks of the mysterious old man occasionally when he is fishing or when he walks past the area where the old man used to fish. We continued to to talk as we walked along the creek so he could show me where the man used to fish, and he admitted that he on occasion whispers a thanks to Ewicher Yeeger when he catches a fish or has a successful hunt. The description given to me about the mysterious man was that he was a Braucher or a Hex and that the man relating this story to me was witnessing the hermit's rituals. The man with whom I was speaking was born "during the time that the people were depressed" so he is likely at least in his 80s, and he said the hermit was very old when he was about age 11-15 or 16. This would put the hermit as being born sometime, perhaps during the 1850s-1870s. The man said he would ask his brother if he remembered any other stories that the old man or anyone else told when they were boys and he'd contact me if he learned anything.